The Saguaro cactus (pronounced Sah-wa-ro) grows exclusively in the Sonoran Desert, which extends into areas of California, Arizona and Northern Mexico. It’s an incredible plant with amazing characteristics and a lifespan measured in centuries. The Saguaro is incredibly slow growing. After 10 years, it’s typically only about 1 ½ inches tall – that’s inches, not feet! But as the decades roll by, it reaches a full height of 40 to 60 feet and can weigh 3,200 to 4,800 pounds. Saguaros can live for 150 to 200 years. 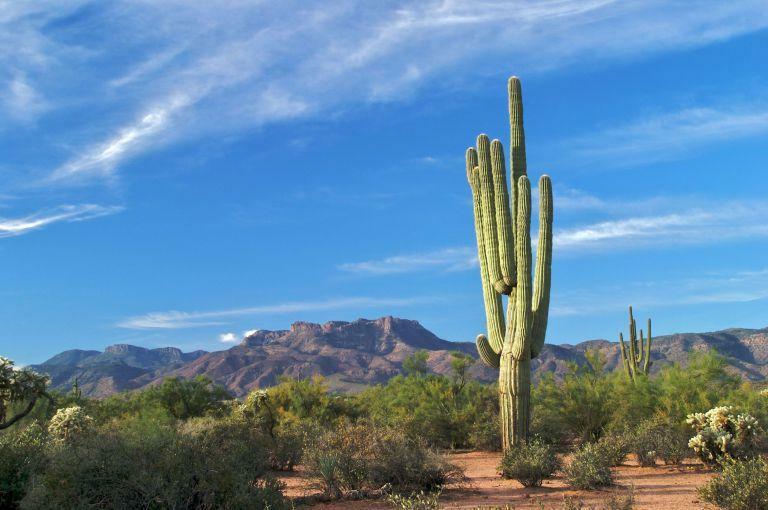 Just like the Saguaro, it takes time to grow an investment portfolio. A lot of time. The power of compounding is always present but really starts to kick in after about a decade. We can’t get frustrated and try to accelerate this process by taking unnecessary financial risks. The Saguaro’s life cycle is quite volatile. Neighboring animals are constantly drilling into the cactus to extract water. Along with variations in the local climate and particularly rainfall, this means that the Saguaro’s water reserves can vary significantly. They can shrink or swell in size by 20-25% over the course of a year. Investment portfolios can undergo similar volatility. That’s the “environment” of the investment trade-off: the potential for return is paired with the potential for volatility. And like the Saguaro we need to persevere. The Saguaro doesn’t shrivel up and die but rolls with the punches and continues its progression of growth. The Saguaro has a very particular blooming cycle. Once per year, in the late spring, its white flowers bloom at night and last through the next midday, providing only a small pollination window. The flowers secrete a sweet nectar that attracts birds, bats and other insects who pollinate the blooms, leading to Saguaro cactus fruit in the fall. A single fruit can produce thousands of seeds to help grow the next Saguaro. Like the Saguaro’s small pollination window, we don’t know in advance when investment gains will happen. There’s no shortage of theories about how to try to time the market, but historically the best approach to avoid missing out on gains has been simply to stay invested and let the power of the market work for you. Doing so allows folks to not only reap the fruit of ongoing interest and dividends, but also to grow portfolios through capital appreciation. Saguaros are considered to be a foundational or keystone species.They provide much to their local ecosystem – nesting, homes, and water to numerous animals including owls, woodpeckers, snakes, mice, bats, insects, and even bobcats. Portfolios are also foundational. They serve a greater purpose than their own numerical value. Ideally, we’ve given them plenty of time to grow and stayed with them through thick and thin. In return, they will fund our personal lifestyles, goals and dreams as well as potentially those of our family or favorite charities.